Luciana is an Advertising Executive with 13 years of industry experience. She currently serves as the General Director for Boost Brand Accelerator by Luciana Olivares in Peru. Prior to this, she served as Managing Director at BBVA Banco Continental in Peru, a leading financial services company belonging to a prominent international financial group. Within this role, she is focused on the identification of communication opportunities, the creation of strategic environments, and the continuous development and innovation of teams.Luciana has held other roles at BBVA, including Manager of Audio/Visual Projects for the Latin American division, Image Bank Developer and Creative Editor-in-Chief, where she managed BBVA Banco Continental's account for large scale advertising and BTL. 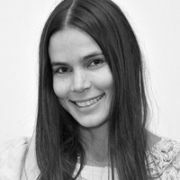 She has also worked as Professor of Strategic Planning at the Instituto Peruano de Publicidad, and as a Documentary Screenwriter.